Land at Circus Street (the former municipal fruit and vegetable market and university annex building) is being developed as a mixed-use scheme and ‘innovation quarter’, expected to create 400 jobs and inject £200 million into the city’s economy over the next 10 years. 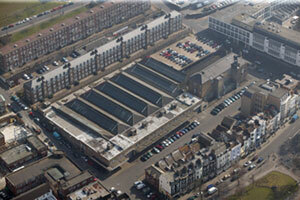 The scheme is being delivered as a public-private partnership by the developer U+I and Brighton & Hove City Council. Funders of the scheme include GCP Student Living plc (the UK’s first Real Estate Investment Trust focussed on student residential accommodation) and Gravis Capital Management Ltd.
New restaurants or shops at ground floor level around a new public square. U+I are promising a “new genre” of urban development with green walls, green roofs, 78 new trees and allotments for food growing - producing over 200kg of food per year for residents. New teaching and research facilities would be created for the University of Brighton. Under the development agreement completed between U+I and the council in August 2017, the developer will deliver all elements of the scheme except for the university building. The majority of buildings will be completed in 2019, with the University of Brighton bringing forward plans for their new building at a later date.